Louis XIV is one of the best-known monarchs ever to grace the French throne. But what was he like as a young man—the man before Versailles? After the death of his prime minister, Cardinal Mazarin, twenty-two-year-old Louis steps into governing France. He’s still a young man, but one who, as king, willfully takes everything he can get—including his brother’s wife. 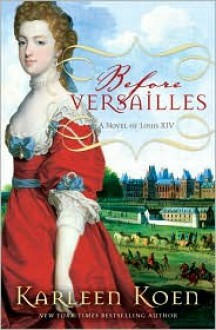 As the love affair between Louis and Princess Henriette burns, it sets the kingdom on the road toward unmistakable scandal and conflict with the Vatican. Every woman wants him. He must face what he is willing to sacrifice for love.But there are other problems lurking outside the chateau of Fontainebleau: a boy in an iron mask has been seen in the woods, and the king’s finance minister, Nicolas Fouquet, has proven to be more powerful than Louis ever thought—a man who could make a great ally or become a dangerous foe . . .Meticulously researched and vividly brought to life by the gorgeous prose of Karleen Koen, Before Versailles dares to explore the forces that shaped an iconic king and determined the fate of an empire. Very interesting story about a time that I have always been interested in. This book has def. prompted me to take a deeper look into this period of time. Interesting story, but didn't really have a "pop" factor which would have me increase the rating I gave it.